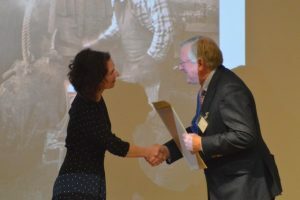 Suzy Bennett was awarded the Marsh Volunteer of the Year for the Dartmoor Artisan Trail, which she set up to provide rural craft businesses with a new income stream from tourism. Suzy spent 18 months working full-time on the project on an entirely voluntary basis, photographing 28 Dartmoor craftspeople for the accompanying photographic exhibition. Suzy has not only brought a new market to Dartmoor’s craftspeople, but is also inspiring the public to learn about traditional crafts. The project has been featured in The Guardian and Daily Telegraph, who named it one of the UK’s best travel experiences of 2017, and on BBC Countryfile. Suzy also won an award for the UK’s Best New Tourism Project, from the Guild of Travel Writers. Suzy has been contacted by several people wanting to set up similar trails in other parts of the UK, as well as in Europe and as far afield as Madagascar, so the effect ofher efforts have gone far beyond Dartmoor.